Many eyes are on San Francisco's trial of performance pricing for parking. The SFMTA has just announced its first price revisions under the SFPark trial. Donald Shoup tweeted the link, calling it 'the world’s first parking price adjustments in response to parking occupancy rates'. The announcement links to various details and data, including an easy-to-understand map (PDF). In case you missed the earlier news about SFPark, the idea is to trial Donald Shoup's proposal for parking prices that target 15% vacancy rate at all times by making prices vary from place to place and time to time. 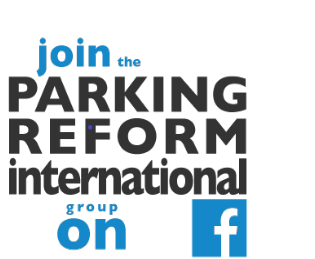 The aim is to get enough vacancies to eliminate 'cruising for parking'. By the way, the Spring 2011 Access magazine has a concise update and summary of Shoup's parking policy suggestions and their uptake in various places. So, in this SFPark price review, places and times with high parking occupancy rates see price rises, while blocks and times with low occupancy rates see price decreases. The small changes (never more than 50 cents at a time) that were just announced are the result of automatic monitoring over the last two months or so. Here is one of the maps. These maps are fascinating. Suspicious souls have tended to assume that SFPark will all be about price increases. The maps show otherwise. Many blocks will have price decreases at various times. Some places that are close together see their prices moving in opposite directions. 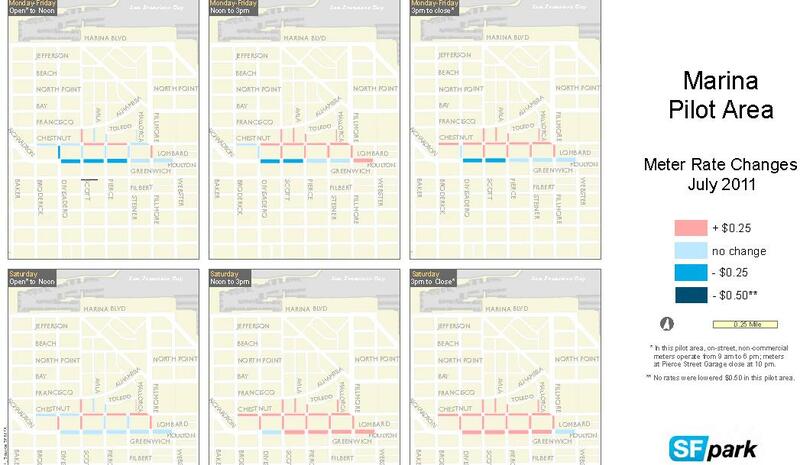 These maps should demolish the simplistic idea that we can talk about a whole district having a parking shortage. Whenever you hear such a claim you should ask: Which section of which street do you mean? And at what specific times? I am not too surprised by the patterns we see in the maps. But the details are still full of interest. And it remains to be seen how the prices evolve over time and at what rates they might settle down to. But a much more important question is how this will go over in public perceptions and in the local political scene. THAT is what SFPark is really testing, I think. And it is the politics that will determine whether it truly becomes a model for others to emulate. The city of SF is really using parking as another source of revenue with the new SFPark system. There's a great website for those commuting or living in the city who need monthly parking - www.cheapmonthlyparking.com. This site provides a lot of good insight of monthly rates in different areas. Might be a little cheaper than paying at the meter! Who's afraid of the spillover bogey?